Since first making wine at Wooldridge Creek in 2003, Kara Olmo and Greg Panietz — with business partners Ted and Mary Warrick — continue to work toward their vision of sustainable farming and making fine wine and food. 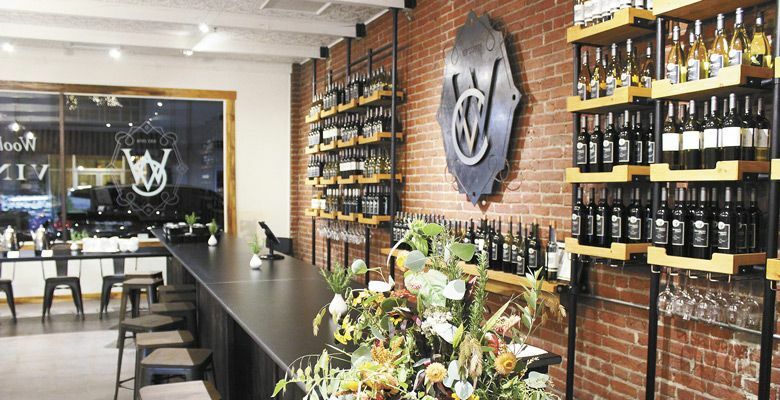 Now, they officially have their own restaurant: Vinfarm. 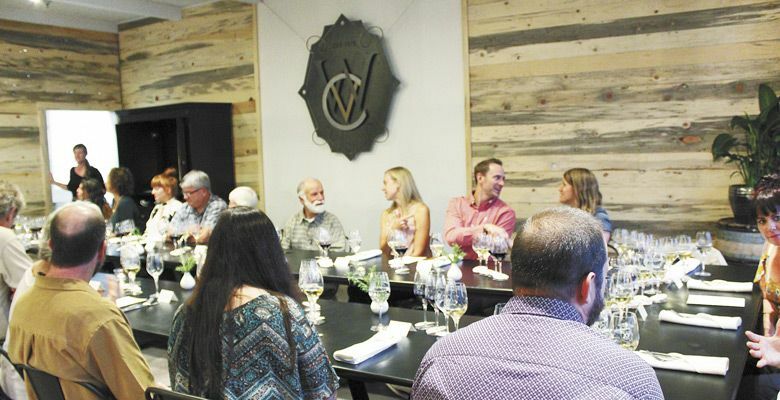 Vinfarm is the brand’s latest endeavor, bringing their rural Applegate vineyard and winery to downtown Grants Pass, featuring its estate wines and a carefully crafted menu of fresh, house-made food. Vinfarm opened in September, just as harvest began. “We thought about how many visitors and potential visitors were going up and down I-5 and couldn’t make time in their itinerary to come out and around the Applegate,” Olmo explains. Even though Wooldridge Creek is only 25 miles from Grants Pass, Vinfarm is that much closer to the major traffic flow. The urban tasting room and events center, a sophisticated and comfortable space, features reclaimed wood and vintage-painted tin ceilings. The adjoining dining area seats 15 to 25 comfortably, and both public spaces — available for private parties — have big, bright windows open to the street. 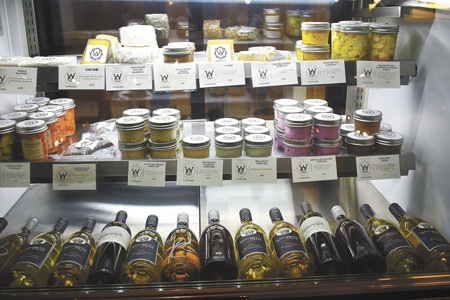 Inside, a case displays mouthwatering items made in house, including cheese and charcuterie. Open daily, noon to 7 p.m.
Olmo began making cheese in 2015. 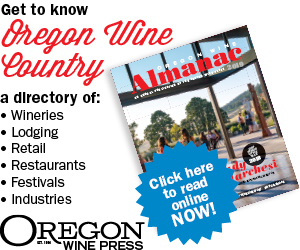 She called it CrushPad Creamery, which became Oregon’s first joint creamery and winery. Wooldridge currently sources cow and goat’s milk from two local organic dairies, making many styles of cheese, from fresh and soft, to aged, hard cheeses. Soon, their own goats — Brownie, Sunny, Mimi, Prancer, Dancer and MooShu — will make their home at the estate, where the entire cheese production takes place. In 2017, charcuterie was added to Wooldridge Creek’s repertoire, focusing on fermenting local vegetables and curing a selection of meats. These offerings firmly established Wooldridge Creek’s reputation for artisan foods designed to match their wines, which include Cab Franc, Cab Sauvignon, Zinfandel, Malbec, Tempranillo and others — the wines are sold only at the winery, on tap at local restaurants and now at Vinfarm. 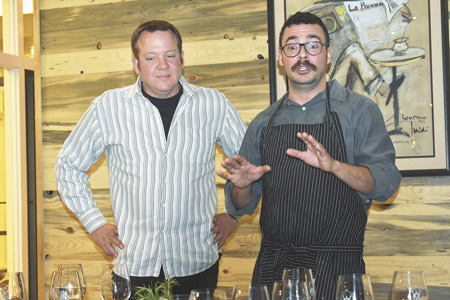 Vinfarm general manager Gabrielle Rysula helps craft the restaurant’s menus with executive chef Chad Hahn. She says, “All of us within the company value fresh-made food; if we put it on the menu, we are going to take the time to make it ourselves.” Hahn’s specialties include charcuterie and ferments. He’s also responsible for wine pairings, carefully made across the entire library of wines. Olmo is always thinking about new product development, working with her team to create charcuterie, cheese and wines as an expression of Wooldridge Creek’s terroir. 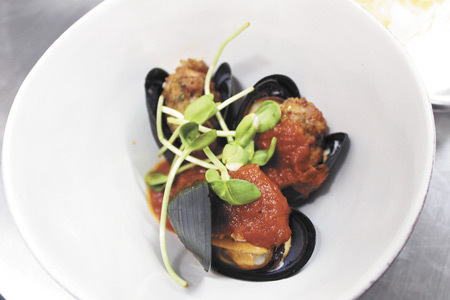 In addition to wine tasting and retail sales of Wooldridge Creek’s delicious cheeses, meats and ferments, Vinfarm offers a mix of small plates for comfortable dining. Tasty bites, hot or cold, as well as salads and soups are also available. Vinfarm’s next prix fixe dining experience, defining Southern Oregon wine country cuisine, will be New Year’s Day.